Obituary for Frances Mae (McClelland) Michaels | Allen Brothers Mortuary, Inc. It is with sorrow and heavy hearts that the family of Frances Mae (McClelland) Michaels announce her passing on March 9, 2019, from the recent pain and health challenges of an 89 year old body. We rejoice she is now with our Lord and Savior, Jesus Christ, in the glories of His Kingdom where she is dancing, once again. Born on January 22, 1930 in Brooklyn, New York, 6 minutes prior to her beloved identical twin sister, Annabelle, Fran grew up in Philadelphia. Her family, then including her younger brother, Robert John McClelland, Jr. and parents, Robert John McClelland, Sr, and Annabelle (Wallace) McClelland moved to a suburb of Chicago, Il, where while in grade school, she met her life’s partner, Lamar (Mike) Charles Michaels. Was it just coincidence that they often lined up alphabetically in class? Not likely! It was many years later that Mike would solidify their role as life partners when he swooped in after another suitor had offered a ring to Fran, and corrected that wrong. Their marriage set in motion a chain of adventurous events that found them the parents of 5 children in just over 6.5 years. Shortly afterwards they packed up to move their family of 7 from the comfort and safety of family and friends in Illinois, along Route 66, to the desert Southwest in Tucson, AZ in 1961. In Tucson, Fran and Mike established a stable, safe, loving Christian home where discipline and respect were hand in hand with faith and love. Fran ran the home and raised her children until the youngest was well into grade school, when she returned to the work-force to increase her contributions to their goals. Using her keen organizational mind, warm and gracious personality, honesty and integrity, along with the administrative support training from years before, Fran made a successful career in the purchasing department of two Tucson hospitals. During those years, more adventures continued during camping vacations in California, and on long road trips across the country to visit relatives in various locations, also camping along the way. These experiences and memories are some of the most endearing for Fran’s children, and the many grandparents, aunts, uncles, and cousins visited along the way. In retirement, Fran and Mike enjoyed many more years in Tucson, with her twin, Annabelle, and her husband, Erving (Erv) Gross, who spent the winter months in Tucson, as well. The bond between the 4 of them grew during those years from strong to deeply exceptional, Christ-like love, with Mike and Erv always respecting and nurturing the special bond between the identical twins. Rounds of golf and casual games of bridge accented their time together. As travel became more difficult for all of them, Fran and Mike, once again, demonstrated their bravery and adventurous spirits together, and moved to Southern California to be close to two of their daughters, and resided in Lake San Marcos retirement community where they had spent many past summers. Here, Fran continued to build new relationships, especially with her caregiver Julie who became part of the family and lovingly assisted Fran as her health began to succumb to the demands of time. 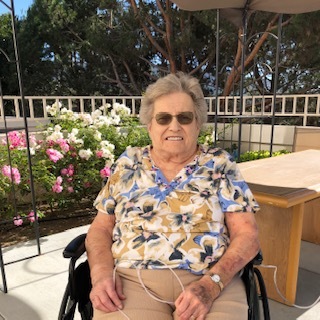 Frances had several health challenges although she met each day always setting her goals towards gaining strength and walking independently without help. To the very end, Fran demonstrated strength and determination, waiting until all 5 of her children could be with her before passing. She left this world surrounded by the voices of her beloved family; reminiscing, singing songs, and quotes from Scripture. For all that were blessed to experience the power of Fran’s passion, love of life, commitment and devotion, there is now an ache from the hole in our hearts. With God’s grace, we know we will endure. Together we will emulate the endurance we admired and adored in Frances Mae Michaels. Fran was met at the Gates of Heaven by her parents, Robert, Sr. and Annabelle; her brother Robert, Jr. and his wife, Alta McClelland, and their children, Kathy McClelland, Bob McClelland III (Kathy), and Michael McClelland; her brother-in-law Erv Gross; her son-in-law Joseph (Chip) McDermott; and grandson, Andrew Michaels. Those anticipating being greeted by Fran when they are called are her loving, faithful husband, Lamar (Mike) Michaels, and her five, forever grateful children, Ann McDermott, Nancy Corrales, Donna McIntosh (Tom), Diane Kusunose (Randy), and David Michaels (Tesa). Fran is also survived by her grandchildren: Patrick McDermott (Christina), Sarah Dabbas, David Corrales, Christopher Corrales (Kenia), Angie Corrales, Kyle Kusunose (Marissa), Kevin Kusunose, Kimi Kusunose, and Lauren Simonis (Mason), Kenan Michaels, Staton Michaels, Kira Michaels, and 4 great-grandchildren, and 1 great-great grandchild (another on the way); her wonderful twin sister, Annabelle Gross, and nieces Janet (Gross) Hogue (Rick), Joanne (Gross) Boyer (John), Judy (Gross) Paulson (Randy), Jean (Gross) Dillon (John), Jennifer (Gross) Grais (Michael), and Patricia (McClelland) Paiz (Leroy).